Recently, we did an American Cancer Society walk and they gave survivors a big goody bag with gifts from local businesses. In addition to the big gift bag, we were given a flower. There were a couple options of flowers to choose from - they put about two plants (two sections form a big flat) into a clear plastic bowl and covered it with purple cellophane. I chose a small purple flower because of the purple theme of the event and I put it outside when we got home. I was forgetting about it and left it in that disposable bowl for too long and it was looking like mold was growing on the sides and the flower wasn't so happy. I wanted to do something with it, but I wanted to know what it was before deciding what to do. 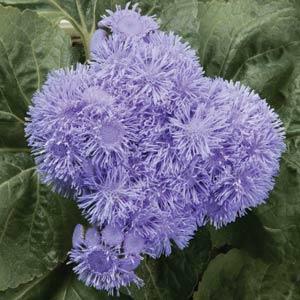 When I picked it up at the walk, it came with no description card, but after searching through some 'small purple flower' categories online, I have concluded it is something called ageratum or floss flower. It is an annual who blooms from spring all th way to fall. It doesn't care if you water it, if its in the blazing sunshine or just a bit, it doesn't need to be pruned, and it doesn't care if its in a pot or in the ground. It is the happiest, most resilient little pretty plant I have made friends with. I planted it into a fresh clay pot and it is as happy as a clam. 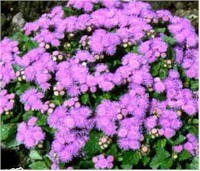 It is such an appropriate plant for a cancer survivor. It will deal with anything, sub optimal conditions even, if it feels like crap, it still smiles. It is just happy to be alive.